Prep: 20 min., Chill: 10 min., Bake: 15 min. Note: For testing, we used White Lily Self-Rising Soft Wheat Flour. 1. Cut butter with a sharp knife or pastry blender into 1/4-inch-thick slices. Sprinkle butter slices over flour in a large bowl. Cut butter into flour with a pastry blender until crumbly and mixture resembles small peas. Cover and chill 10 minutes. 2. Turn dough out onto a lightly floured surface; knead 3 or 4 times, gradually adding additional flour as needed. Sprinkle top of dough with additional flour. Fold dough over onto itself in 3 sections, starting with 1 short end. (Fold dough rectangle as if folding a letter-size piece of paper.) Repeat entire process 2 more times, beginning with pressing into a 3/4-inch-thick dough rectangle (about 9 x 5 inches). 3. Press or pat dough to 1/2-inch thickness on a lightly floured surface; cut with a 2-inch round cutter, and place, side by side, on a parchment paper-lined or lightly greased jelly-roll pan. 4. Bake at 450° for 13 to 15 minutes or until lightly browned. Remove from oven; brush with 2 Tbsp. melted butter. Cinnamon-Raisin Biscuits: Omit 2 Tbsp. melted butter. Combine 1/2 cup golden raisins, 1/2 tsp. ground cinnamon, and 1/3 cup chopped pecans with flour in a large bowl. Proceed with recipe as directed. Stir together 1/2 cup powdered sugar and 2 Tbsp. buttermilk until smooth. Drizzle over warm biscuits. Good biscuit. Light, fluffy, nice rise. Try pastry flour if you can't find the soft wheat flour. 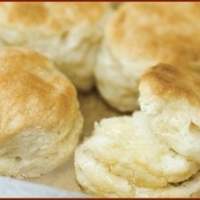 See Southern Livings Best Buttermilk Biscuits for more. Hi Lana --- The reason cake flour is not recommended for biscuits is because it makes them too crumbly. I'm not sure what soft wheat flour is either? These look AND sound wonderful - love biscuits and jam, and I just brought home some peach butter from our trip to Lake Superior this weekend...perfect timing! What is self rising soft wheat flour? I know what self rising flour is but have never heard of soft wheat flour. Oh do these look delicious. Thanks Lana. Mmmmmmm, Yummy - this looks amazing!